Whether you’re looking for a quick after school snack, or a quick dinner, these easy chicken salad wraps are great for the whole family! 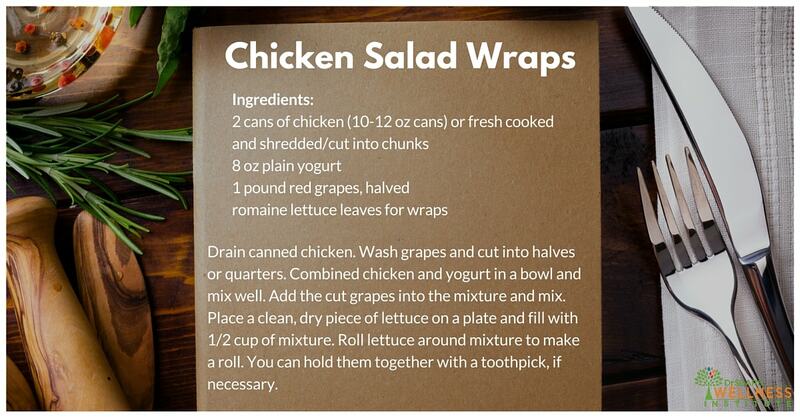 If you don’t have time to cook fresh chicken, you can use cans of chicken. As always, be sure to read the labels! Want to spice things up? Add salt, pepper and other spices to taste. Celery also makes a nice crunchy addition. Enjoy! Drain canned chicken. Wash grapes and cut into halves or quarters. Combined chicken and yogurt in a bowl and mix well. Add the cut grapes into the mixture and mix. Place a clean, dry piece of lettuce on a plate and fill with 1/2 cup of mixture. Roll lettuce around mixture to make a roll. You can hold them together with a toothpick, if necessary. [...] recipe that actually combines both blending and juicing!...April 12, 2012 - 8:49 am by Juicing vs Blending - Which is better?